I want to say that someone emailed me — recently, even! — asking if there were a lot of patterns with sweetheart necklines around. Like this one, above. Except she didn't know the term "sweetheart neckline," and maybe just said "a dress like today's dress"? Which means searching for it in my email archive is futile. Anyway, if you asked, this is my answer, and it is available from Miss Helene's for $9.99, and it's a B37, so have at it! Another Lisa (not Lisa at Miss Helene's) wanted to know why her finished sewing projects always look "homemade" to her eyes, when she compares them with garments she sees in the store. She says she's not an odd size, and she uses better-quality materials than the store-bought stuff, so why don't her garments look better? My vague answer is that it's probably the pressing: I find that whenever I make something that looks at bit off for some undefinable reason, it's because I rushed through the pressing-seams bit. The more time I spend with the iron during construction, the better stuff looks. But I admit that's a vague answer and it could be any number of things, so if you have a better answer for Lisa, please let me know! The last question for the day is from Lynn, who wants tips on how to organize her Brand! New! Sewing! Room! (exclamation points mine; I have a kind of punctuation hemochromatosis, where I must be bled of exclamation points at regular intervals, lest my major punctuation organs go into shutdown). I am still trying to organize my OWN sewing room, after two years in it, so I'd appreciate any hints on this topic you care to give. I told Lynn to go look at Posie's studio as inspiration. Any others come to mind? "If you want to think of it that way." "Could be; I'm not sure." "Let's try it and see what happens." "I thought that's what s/he said." Apply freely to your own questions! re: buttonholesyes! one of the great advantages of making your own clothes (or having them made for you) is the ability to have buttonholes any which way you want. if horizontal buttons provide a better (and more secure) fit, then that most certainly would look better than vertical buttonholes that gap. (although could this be more of a problem with darts and other bust seams, adaquent fabric, etc.? dunno) if you look at a well-made (and often custom) men’s dress shirt, the majority of the holes are vertical with the exceptions of stress points. the vertical buttonhole is more hidden as the button should sit in the middle of it, whereas in a horizontal buttonhole, the button normally sits over to one side, exposing it. if your home machine makes buttonholes like mine (nice but not delicate like the ones you see on high quality rtw) you’ll want to cover them up. :)coats and jackets on the other hand, tend to have horizontal buttonholes which makes sense as they are meant to be layered, resulting in more stress on the opening. My understanding on the buttonhole issue is that vertical buttonholes are used in a band, as on a man’s shirt(except the collar band, which is horizontal), and horizontal buttonholes are used everywhere else. It used to be that bound buttonholes looked homemade, mostly because they were not used on RTW. They were a mark of couture or hi-end RTW in the 60s and I’m glad to see they are back again in RTW, after a period of commercial disuse.I’m with all the people who believe that pressing makes the biggest difference in whether a garment looks homemade. Fabric choice is also a major determinant. To the lady who has bust issues with a Kimono sleeve: a soft, drapey fabric is what you need. A nice silk or rayon, or a thin knit, cut without too much fullness should work. Base your fabric choices on what seems to work in RTW.I’m a big fan of wool; it always gives a professional look. Moreover, it’s easy to sew and ease, easy to press and lasts forever with minimal wrinkling. My favourite wool is doubleknit. It simply sews beautifully and looks nice on. My daughter is now wearing a pair of wool doubleknit leggings I sewed when I was pregnant with her and later altered to fit. They still look great and are right in style. They don’t look like pantyhose, as do some of the leggings I’ve seen girls wear this year. The right fabric can go a long way to a professional look.I, however, like Erin, love conversational prints, which, face it, are rarely used in RTW. But who cares? It’s all about being creative in your dress! I had a much loved monkey printed corduroy wrapskirt at one time, and my daughter just gave me an apron printed with pattern pieces. I would love to have a silk blouse printed with pattern pieces! On my desk is another good place to get a look at other people’s creative spaces. As a professional of sorts, I am confused by the sleeve cap discussion. In tailoring, we would expect the sleeve to be at least 2″ bigger than the armhole. It does depend on the garment and the fabric, though. Ditto what the whole world said about pressing. But also I think the bulk of the work is in the preparation. I’ve never stay-stitched anything in my entire life, but I do a whole hell of a lot of basting, and pressing, and I probably spend less than 5% of my working day at the sewing machine, if that. One day I will have to work it out, but it is a teeny tiny percentage. It’s all in the preparation. And the pattern. 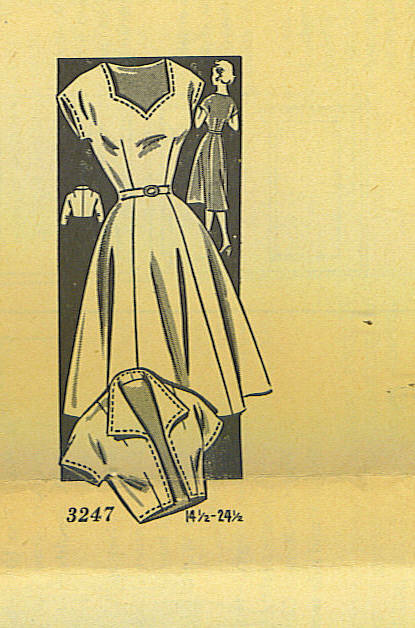 Commercial home-sewing patterns are truly evil in that respect. Learning to draft your own isn’t that hard and will ultimately give you much better results. I’m going to skip the subject of looking homemade because you all have done such a detailed job it will require a few reading on my part to absorb it all. To Lynn the only thing I can offer is, however you arrange your room, make sure you keep as much as possible visible or labeled. Nothing will drive you crazier than trying to remember where you put a seldom used tool or a piece of just the right interfacing or even buying something you already have. Congrats on your room! So many great comments! I just wanted to add that “punctuation hemochromatosis” made my day (I also like Gratuitous Capitalization; both remind me of Miss Climpson’s letters to Lord Peter Wimsey in “Unnatural Death” (yes, I am a big nerd). I swear I must have some kind of pattern drafting brain malfunction. I do not find it easy at all. Or should I say, drafting patterns that fit properly – FAIL. Want to share some of your mad skillz with me? Just some thoughts based on the comments here:(1) On teaching yourself how to sew better: My fave books that help me sew areClaire Shaeffer’s Couture Sewing Techniques (which has wonderful photos, clear text, and illustrations of a pile of handstitches; as she points out, in couture houses there are almost no sewing machines but there are several ironing boards and irons, underscoring points made in this thread)Pati Palmer & Marta Alto’s Fit for Real People (I haven’t used this one much on my own yet, but used it in a slacks-making class that was fantastic)The Vogue Sewing Book, First Edition 1970 (fantastic at addressing assembly and various styles of sleeves, collars, belts, and fasteners — and I LOVE the circa 1968 photos! very trendy now)Elissa Meyrich’s Sew Fast, Sew Easy. An awesome primer on how to read and execute a pattern; I made the simple skirt pattern in this book and continue to wear it a lot, it’s great. This book has become hard to find, but Meyrich is releasing a new book later this month called Sew On, which includes a Wrap Dress pattern AND a basic t-shirt pattern, as well as others; I’ve already ordered my copy! (2) On RTW vs. Home Sewing: I lived in Portland, Oregon for a couple of years, where Nike, Columbia and several other sportswear companies have headquarters and design their clothes. While there I learned a bit about that industry. RTW patterns are based, in general, on actual people called “fit models” who are “perfect” size 8s. Almost all clothes for all companies, as I understand it, are drafted for fit models, and then specialized software operated by skilled pattern drafters is used to size it up and down from the actual pieces of fabric, cut up, that were used to fit on that fit model. The sizes change over time and the software is updated, although the pattern companies do NOT go out and find “perfect” size 16s, for instance, to make clothes for, AFAIK.Home-sewer pattern sizes, however, were drafted sometime back in the 1940s, and the sizes have not changed since, at least in the pattern companies that have been creating patterns since that time. Among other things, this is why your home-sewer-pattern size is usually quite different from your RTW size (ie, I wear a 12/14 off the rack but measure as an 18 or 20, depending on the pattern company and whether it’s a top or bottom, for home-sewing purposes). There are very standard drafting and alteration “rules” that have changed little in the home-sewer pattern-making industry, over all these decades. Author and sewing guru Pati Palmer argues that all this is a GOOD thing for the home sewer, because it reflects standardization in the home-sewer-pattern industry, whereas “vanity” sizing and changes in fashion and technology have led to dramatic size and fit variances in the RTW clothing industry. Therefore, they’ve reduced the guesswork or legwork that would be introduced if you had to, every time you wanted to sew a new pattern, make a muslin, and learn a bunch of new alterations, and in general “figure it out” on your own.In theory, if you pay a lot of attention during the first few garments you make, you’ll have a lot of fitting and altering information that you’ll be able to apply to get the perfect fit, aided by the standardization that allows you to judge the fit and adjust it for every standard pattern.In practice, does this work? I would say, sort of. It’s definitely a relic of an era when hand-made clothes were a status symbol; these days, except for the most couture of couture, it would look tacky to have handmade seams, even though my mom’s “nice” dresses from local dress stores that she bought in the 1960’s all have hand stitching in them. (3) On my own tools: I have a sewing machine (bernina,it’s okay, not great), a serger (secondhand, okay, not great, but awesome for clipping and binding seam edges so they lay flat pretty much forever regardless of how you clean the garment), and a growing repertoire of hand stitches (so slow, but so lovely when I take the time, which I pretty much always do for hemlines and tricky construction. ).I also am a big fan of my Styling Design Ruler, which has a big curve on it that allows me to smooth the lines when I have to adjust the hip-to-waist ratio or increase or decrease an armhole or neckline. It’s easy to use, I recommend it. (4) random trailing threads: I’m no fabric genius, and I have found that buying remnants at my local fabric store (I’m lucky as G Street Fabrics is my local) is the best way to get inexpensive, well-made fabric that I’m not afraid to sew. It can be really hard to know, for many of us, how a big bolt of fabric is going to translate into a garment — the pattern, the fabric content and weave, the colors. So I tend to buy neutrals or classic prints, marked down to around $4/yard, and have been pleasantly surprised by what I’ve got. Don’t spend a lot of money on fabric if you’re a novice sewer!!! Especially if you’re a perfectionist who won’t wear or finish a garment that’s not turning out as good as RTW.I’m going to spend part of the summer teaching myself draping techniques, using the packing tape dress dummy I made a couple of years ago but haven’t really used, and the book Draping for Pattern Design by Hilde Jaffe and Nurie Relis, and a couple of articles in recent Threads magazines about draping for plus-sized women. The more you understand your own body and the more work you do in taking big flat pieces of fabric and fitting them to the real, live, fleshy, curvy you, the better for making great garments!Happy sewing, and thank you Erin for such a great website. Kate in England, that ‘On My Desk’ site is brilliant! Thanks! I’ve not had time today to scrutinise all comments 😦 but in case it hasn’t been mentioned yet, you can at a pinch “press” a seam by scraping it open along the edge of a table, say. Anybody know what I mean, or does that sound totally insane? Patchworkers swear by this method (they would be doing nothing BUT pressing if they had to do all those little itsy bitsy seams) and I’d suggest it for the extremely carbon-conscious sewer. But… pressing’s better. To make things simpler and maximize my sewing time with a lot of small kids underfoot, I cut several garments at once and pin up every seam that can be sewn without crossing another seam. Its easy then to sew up all those seams in several garments (changing thread takes less than 30 seconds on my machine).Then I press everything, pin up all possible seams again, and repeat. I find that both makes the most efficient use of my time AND eliminates that temptation to skimp on pressing that comes from a disinclination to keep getting up and down after every six-inch seam. Kate C., experience in looking at a wide range of garments will help; however, the garment with a “softly rounded” hem will have other indications of couture quality in it: bound or hand-made buttonholes, fabric-covered snaps, carriers for straps, expensive fabrics – outer fabric AND lining – waist stays, interfacing in the hem to keep it in position, hand stitching in some areas, etc.The garment made by loving hands at home will likely have other indications than just the hem, if the hem is an indicator: fabric that may not be ideal for the garment – or really cheap fabric; cheaply or poorly done inner construction; other seams not pressed or not finished, hanging threads, etc. Karen, re: “I have noticed the homemade feel to my own things, and I blame it on my fabric choices. I’ve been getting sucked in by quilting cottons that I adore but that don’t translate to a garment.”I would suggest that you first do some research regarding vintage garments that DID use cottons in those weights, and then translate those shapes into something you can wear. If you’re trying to do something drapey, it’s not going to work; but there are a lot of different styles that would work just fine with some of the quilting cottons that I, too, love.Anonymous on the train, the key here is that the suit lady’s sister trained in a couture house. It isn’t designers who MAKE couture garments, but the workers (mains) who produce them. That isn’t really “homemade,” any more than it’s “homemade” when the IT person builds his/her own computer at home. Although, colour ME jealous!